FTC disclaimer: This is a sponsored post. I am part of the U.S. Cellular Better Moments blogger brigade. All opinions are my own and I only recommend items I think are helpful and beneficial. 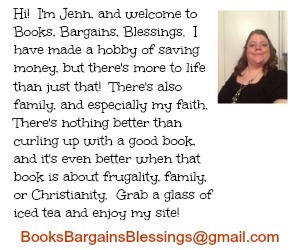 When I first started blogging, I wrote mainly about deals I got from coupons, freebies received in the mail, and other small money saving items. I was a coupon queen before it was cool, and once popularity hit, seemed like deals dried up, so I started looking for other ways to save money. One of them which really surprised me, is to do my taxes myself. Did you know that many accountants charge by the number of papers you have? Last year I earned a small amount of interest in a few different accounts, won a sweepstakes prize, blogging income, and I had a whole slew of 1099s. There was one for three cents! That would have cost me an extra $20 or more at the accountant in town just because I earned three cents in interest. So I did my taxes myself. I was even able to do them on my tablet with TurboTax -- and if you are lucky enough to get a refund you can track it with MyTaxRefund if you e-file. Some might think that because I like to save money I should have gone with IRS Free File but that only allows you to file federal and I wanted to file my state taxes as well. Another app that will help you file federal taxes is H & R Block for iPad. While not free, TaxAct Ultimate Bundle for $17.95 uses an interview process to help save you money. great help. I have been tracking it on paper, but I always have my phone with me, and it's so much easier to pull out my iPhone than finding my finances notebook. I can always transfer it later if I want, but it means no holding on to receipts from several places as I run errands in a day. The interesting thing is, I'm not alone in my use of my smartphone to work on finances. 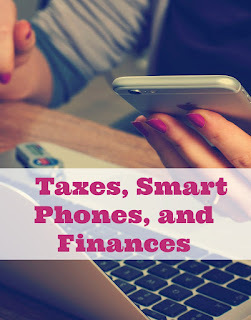 Did you know that 47% of smart phone owners use their device to track finances, and 62% use their smart phone to check on account balances, if checks have cleared, etc. In fact, I'm so much into smartphone usage for my banking that I am considering switching banks for my main account so I can deposit checks by using my smartphone! Of course, as much banking as I do online I also make sure I have a good passcode on my devices because I don't want my information available to others. Side notes to this safety is make sure, especially with financial apps, that the app you are downloading is from a reputable place and doesn't contain viruses or phishing. Also, if you phone is stolen, notify your carrier immediately. Recently a friend had his phone stolen and he realized he needed to go to a neighbor's house to even call the police since he doesn't have a land line. As soon as he called the police, he called his cell phone company. I am always on the go. I do shopping wherever I am. In the past week, I have traveled four hours from home, back home, and then two hours from home. That's a lot of traveling, and it's hard to keep track of all my expenses. The app I just downloaded to help me with this for this next tax year is Slice. It scans my e-mail for receipts and helps me stay organized with where I'm spending my money. I actually never thought of using my smartphone for finances. Thank you for this idea! Wow we have come a long way. I remember when party lines were around. I had no idea you could do all this from a smart phone. No wonder why everyone is always looking down at their phone no matter day night maybe in their sleep! so many great things I need to get one!